Riverside was designed with a vision. Olmsted’s parks and gracious living spaces flow around our quaint city center. 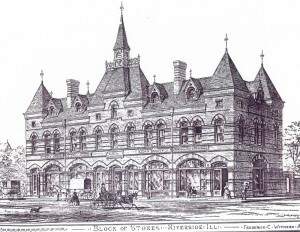 In 1871 the Arcade Building was designed by Olmsted’s then-architectural partner, Frederick Clark Withers, to complete the vision for Riverside: A place where residents could have easy access to all the modern conveniences . . .
Withers was by then famous in his own right as one of the first architects in America to use contrasting materials for the banding of walls and to mark alternating voussoirs in arches (an effect referred to as Ruskinian, after the popular English architectural critic of the day). 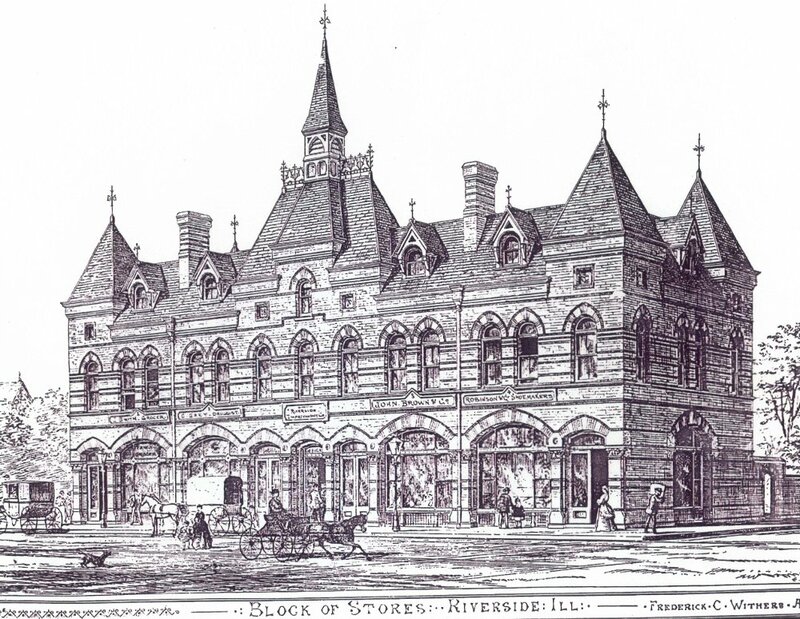 Withers’ creative multi-shop design for what was originally termed “The Riverside Block of Stores” was constructed under the supervision of William LeBaron Jenney, who served as the general contractor. 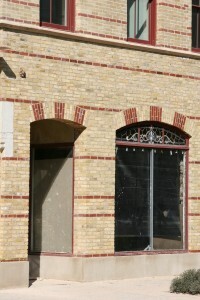 The Arcade uses Ruskinian banding to express a High Victorian Gothic style. On the ground floor, expansive plate glass windows are graced with arched panels of decorative stained glass above. The brick bands frame and peak over high, seemingly narrow lancet windows on the second floor and smaller windows in an array of shapes on the third floor, where the hipped roof and smaller mansard roofs continue to draw the eye upward. The Arcade is one of the few examples of the Gothic Revival architecture of Frederick C. Withers in the Midwest (his prolific career being focused predominantly in New York). It received national publicity following its completion and (not surprisingly) was studied and copied. The Arcade is the recognized precursor for neighborhood shopping centers which followed. 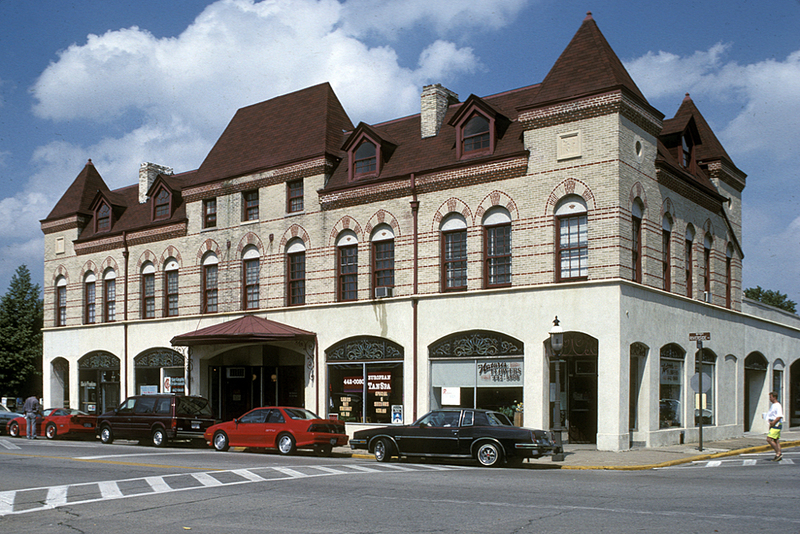 Historically significant in the planned development of Riverside, a national landmark village, as well as for its status as the first suburban shopping center in America, the Arcade building is an integral part of Riverside’s heritage and sense of community identity. 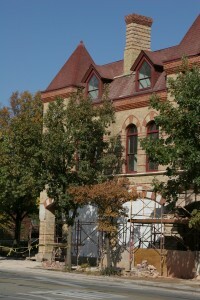 Over time, though, some non-sympathetic changes were made to the exterior. A one story addition was added, ground level brick was stuccoed over, the roof line was significantly altered, asphalt shingle replacing slate. But the Arcade was still fully occupied. 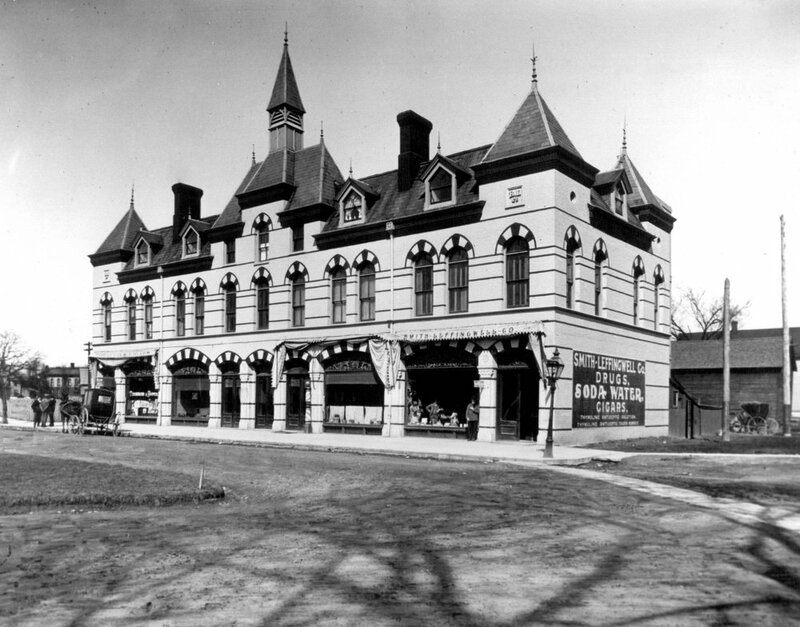 Not too long ago, though, the Arcade went from a building in need of some deferred maintenance to one that was truly endangered. 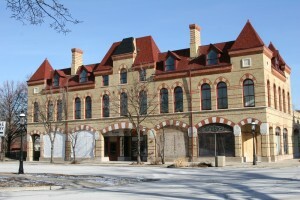 In April 2010, a visionary named Giuseppi Zappani proposed to not only pull the Arcade building back from the brink, but restore it to its 19th century glory. In August, Mr. Zappani closed the deal. 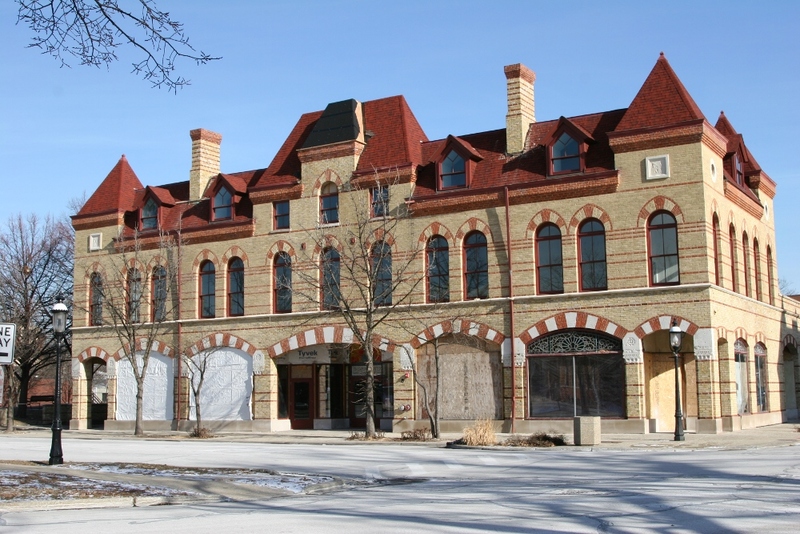 Soon after, masons began restoring the first-floor façade, stripping it of its non-original stucco sheath and reconstructing it in its original Milwaukee cream and red brick, something unseen for decades. Incredible Victorian Gothic limestone details were uncovered. It is for this work, done with such sensitivity for the original materials that the Olmsted Society presents its Restoration Award. 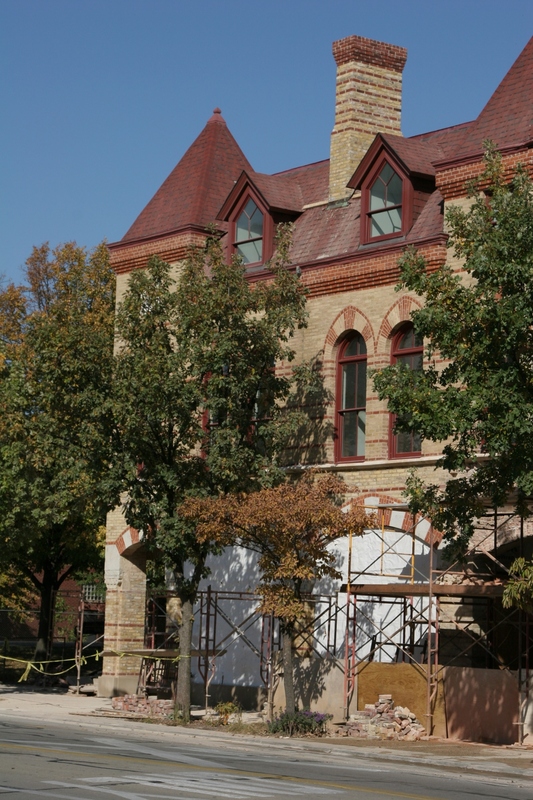 With the brick work complete, the next phase will be to re-glaze the first floor, replace the roof and determine whether the building’s original central tower can be reconstructed. In January, a fitness studio is expected to occupy one of the first-floor storefronts on East Quincy Street, signaling that the Arcade Building is truly back in business. On behalf of the Olmsted Society, we thank you Mr. Zappani. We look forward to seeing the Arcade brought back into service. To be able to gather at its cafes, shop in its stores, conduct business in its offices. To experience a living landmark.